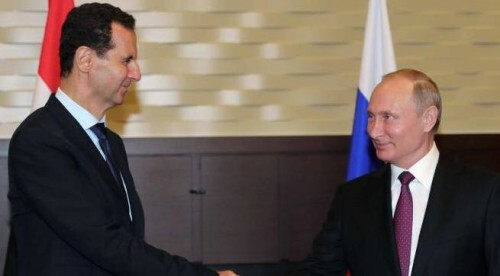 Moscow : Russian President Vladimir Putin told his Syrian counterpart Bashar al-Assad on Monday about his decision to strengthen Syria's air defence, including providing it with an S-300 surface-to-air missile system. "Both sides noted readiness for further joint efforts to achieve long-term normalization in Syria, restoration of its sovereignty, unity and territorial integrity," a Kremlin statement said, Xinhua news agency reported. Earlier in the day, Russian Defence Minister Sergei Shoigu said Russia will supply an S-300 air defence system and identification, friend or foe equipment to Syria within two weeks after its Il-20 surveillance plane was mistakenly downed by Syria's S-200 system last week. In areas adjacent to Syria over the Mediterranean, Russia will carry out radio-electronic suppression of satellite navigation, airborne radars and communications systems of combat aircraft attempting to attack facilities on the Syrian territory, Shoigu said. The Russian Defence Ministry has said that the Il-20 plane with 15 servicemen on board was shot down by mistake on September 17 by a Syrian missile due to a simultaneous Israeli air strike that confused Syria's S-200 air defence system. The Israeli military rejected the accusation that its jets deliberately used the Il-20 as a shield and led to its downing. Kremlin spokesman Dmitry Peskov said Moscow's decision to strengthen Syria's air defence was made after week-long discussions between the leadership of the country and military experts. He said that the deployment of the S-300 system in Syria does not target a third country.